Palladium was a standout performer in 2018, not just among its precious metals peers but across major asset classes, as John Ciampaglia, CEO, discussed in his post on palladium last week. At yearend 2018, spot palladium prices closed price-per-ounce, having gained 18.6% for the 12 months. For the three-year period from December 31, 2015, to December 31, 2018, palladium’s price more than doubled, from $563 to $1,262 (up 124%). Source: Bloomberg. XPT represents platinum; XAU represents gold; XPD represents palladium, XAG represents silver; SPXT represents S&P 500 Total Return Index. At the time of this writing, palladium prices had overtaken gold for the first time since 2002 ($1,344 versus $1,295 as of January 9, 2019). 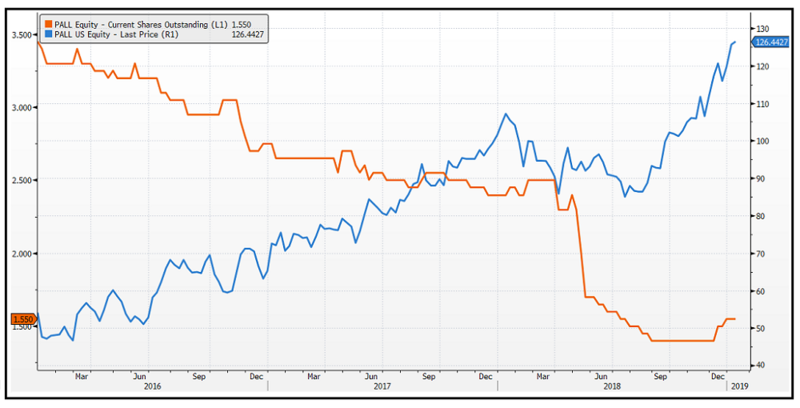 Palladium’s price appreciation is best understood by analyzing the very unique supply-demand dynamics behind the metal. 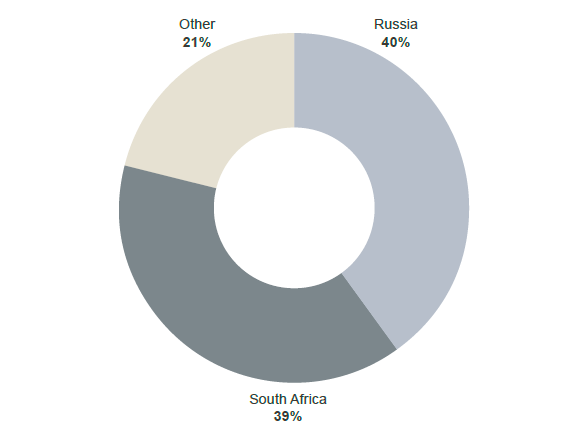 Palladium mining is exceptionally concentrated with Russia and South Africa accounting for 79% of the estimated 2018 production. Typically, palladium is a by-product of mines that are built to extract other key industrial metals like platinum and rhodium, since palladium tends to co-occur in these ore deposits. Although palladium prices have doubled since the end of 2015, this increase has not been material enough to entice meaningful production increases from existing mines or investment in new mines, given the complex and relatively inelastic extraction economics of palladium mining. Looking ahead, we believe that palladium mine supply will remain fixed, with no large palladium mines coming online in the near term. Autocatalytic converter use accounts for 75% of the net demand for palladium. This trend appears to be on the rise and is being driven by several factors. Air-quality standards for automotive exhausts are on the rise around the world as countries such as China and India grapple with smog. This has necessitated increased use of palladium in catalytic converters. The drop in diesel automobile sales due to the now infamous “Dieselgate” has led in higher sales of hybrid and gasoline powered automobiles. Well into the 1990s, platinum was used to catalyze the conversion of noxious automotive emissions in both gasoline- and diesel-powered cars. Palladium was substituted with platinum as a way of lowering the build cost of a catalytic converter in gasoline and hybrid automobiles. 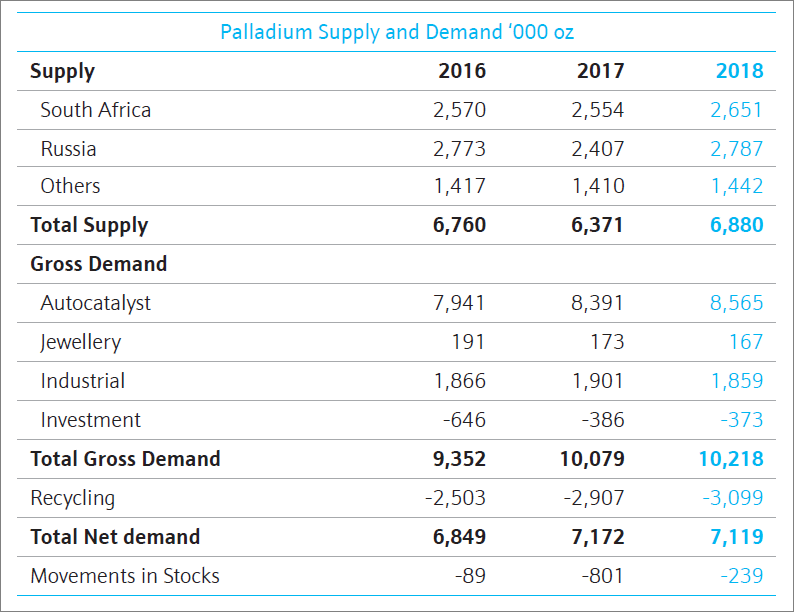 The use of palladium in autocatalysts surged in 2017 to a new record of 8.39 million oz. and is estimated to come in at 8.57 million oz. for 2018. The inverse of contango is “backwardation,” which occurs when the futures price of a commodity is lower than the future expected spot price. As you would expect, given the costs of having the metal safely stored until delivery, backwardation is uncommon in metals markets with normal levels of supply. Yet, palladium futures have been in backwardation all year, indicating a very tight physical market for palladium. The long duration of backwardation in palladium futures is unsurprising given that palladium has been in a persistent deficit since 2010, with 2015 being the most recent exception. 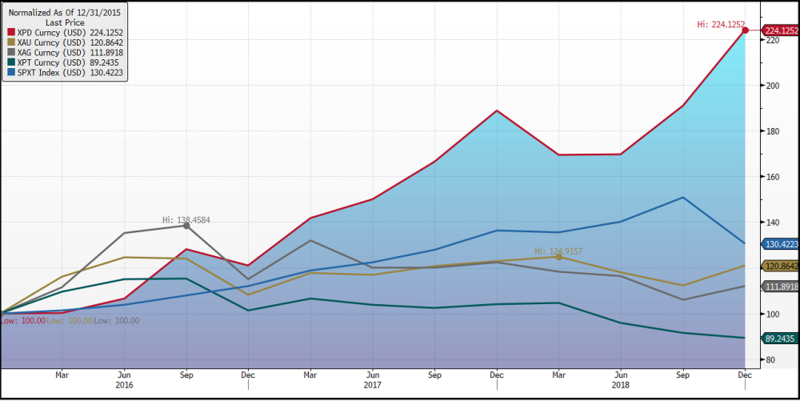 The tightness of the palladium market is most apparent when looking at palladium ETFs, where market makers have continued to redeem their units to take delivery of the physical metal in order to meet the persistently high level of demand while the price of palladium has continued to rise. Figure 5 highlights units outstanding of the Aberdeen Standard Physical Palladium Shares ETF (PALL) versus its price. If automakers originally moved to palladium as a cheaper substitute for platinum, why haven’t automakers switched back to platinum, given that platinum is trading at close to US$500 an ounce to palladium? There are manufacturing, engineering and supply-chain costs involved in changing the chemistry of autocatalytic converters from palladium back to platinum. Global economic and trade uncertainties are top of mind for executives. They recognize that if a global trade war breaks out, automotive sales could be significantly affected, which would likely ease the current palladium deficit and cause the price premium to evaporate. In this scenario, the investment capital required to switch from using palladium to platinum could well prove unnecessary and costly. The market share of pure electric vehicles (EVs) is small but continues to rise rapidly. In November 2018, annual EV sales in China surpassed the 1 million mark and for the first time climbed 68% year over year. Over the same period, overall vehicle sales in China declined by 14% compared to November 2017 ― the fifth straight decline.4 With all major automakers shifting focus from gasoline/diesel powered vehicles to EVs and plug-in hybrids, the need to change catalytic converter chemistries will not be felt unless the pricing situation becomes critical. 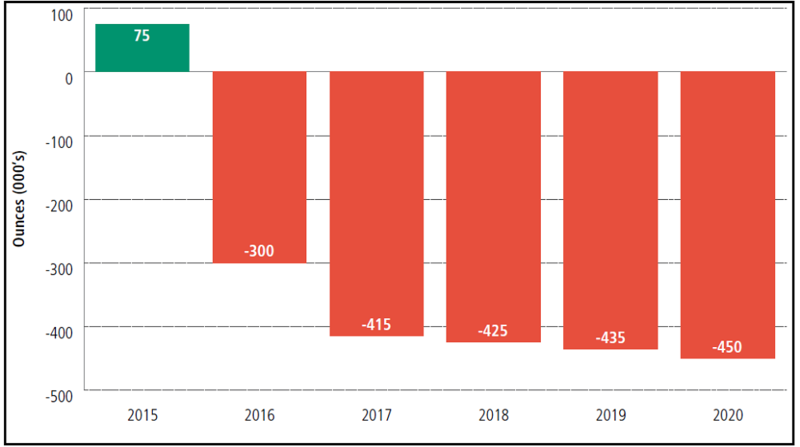 Regardless of this uncertainty, we believe that the situation will become more critical for automakers as palladium deficits now begin to attract speculators. Our industry sources are of the opinion that most Original Equipment Manufacturers (OEMs) would need at least 18 to 24 months to engineer platinum into the autocatalytic converter (ACC) to replace palladium. Barring a widespread global economic slowdown, it appears inevitable that OEMs will once again shift back to platinum. The question is when. 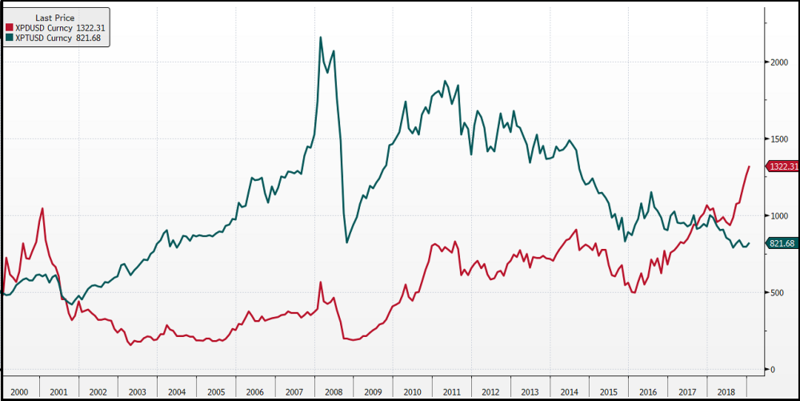 As a result, the long-term investment case for palladium becomes more uncertain beyond 24 months. However, over the next 18-24 months, we believe it is likely that palladium prices will remain robust as automakers scramble for the physical metal. Confirming this, investor speculation in the palladium market has modestly increased as a result of recent tightness. Our view is that palladium’s fundamentals should remain strong for at least the next 24 months. 1 The S&P 500® Index represents 505 stocks issued by 500 large companies with market capitalizations of at least $6.1 billion; it is viewed as a leading indicator of U.S. equities and a reflection of the performance of the large-cap universe. The TR Index represents dividends reinvested. 2 The Wall Street Journal, Year-End Review & Outlook of Markets & Finance, January 2, 2019. 4 The Wall Street Journal.